I’ve known Lin Pophal for years through her work as a writer for eContent, HR Executive, and others; have pitched her client stories and my own thought leadership topics (I’m in her eContent story on content curation tools). Earlier this year, Lin posted a Profnet about the changing world of PR. Readers here know that it’s a pet topic of mine, and I eagerly replied. 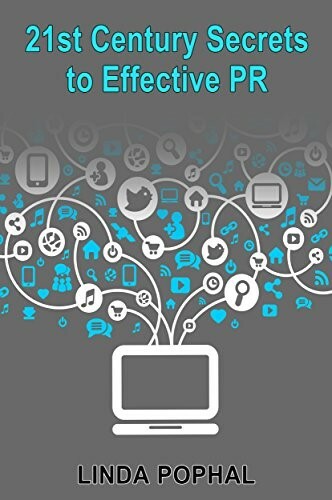 Then, I forgot about it, until she emailed recently that my commentary was included in her new book: 21st Century Secrets to Effective PR. I was, of course, thrilled to be in it and eager to read Lin Pophal’s book. I wanted to get Lin’s take on the topic, and also was curious about her PR background, since as I said, I first got to know her in her journalist role. I found it to be a great read, with helpful insights about where the field is now, where it is going, and a wealth of actionable tips for maximizing results. I also learned about Lin’s agency work at Strategic Communications; and that she teaches, and has written quite a few books on PR and marketing. Journalists have called PR the Dark Side, now quite a few wear both hats. Is this a sign of the future of PR (and journalism)? I definitely think that it is. Much of this may be because of the shifts taking place in journalism these days–traditional media outlets struggling to remain viable resulting in many journalists finding themselves needing to pursue different types of work; the rise of the “citizen journalist” where just about anybody can hang out a shingle and be a “writer;” the blurring of the lines between PR and marketing, news and advertising. In smaller markets, like where I live, there has long been a tendency for media professionals to seek corporate roles when they become available. When I was director of corporate communications at a local healthcare organization, I would regularly receive a number of resumes from reporters whenever PR jobs opened up. Is there the potential for conflict? Yes. It’s interesting to me that the digital world is still very different than the traditional when it comes to revealing what is “advertising” and what is “news.” Run an ad in a newspaper and it needs to be labeled as an ad. Include a link in an online news piece, though, or pay an influencer to promote your brand in their blog post and it gets a bit murkier. I think the regulations that are emerging are good but more needs to be done to distinguish native advertising from news. The focus on “fake news,” I believe, will definitely aid this process and may result in the pendulum swinging back to reward professional journalists, with a clear distinction between them and anyone with a Twitter feed. I think there’s also the potential for confusion and the proliferation of, if not “fake,” just misleading information. Forbes “contributors” and other similar sources of information are a good example and I’ve straddled the line with this for some time. With my “journalist” hat on I find the proliferation of these types of sources to be troubling and misleading–they appear to the casual observer to represent well-reported and edited pieces appearing in reputable media outlets. Yet they’re really simply PR pieces. I definitely cautioned students in my university classes against using these types of sources as credible references in their papers/projects. With my PR hat on, though, I’ve helped clients land these types of opportunities. Is it interesting to get pitches? It is very interesting to get pitches and I’ve learned a lot from those that cross my desk–both what to do and what not to do. So I think I’ve become much better at pitching myself and my clients and getting coverage. Reviewing HARO and ProfNet pitches also helps me to stay up-to-date on trends and topics that I might not otherwise have been exposed to. Many times an item I see will prompt me to do additional research to learn about something I hadn’t heard of before. What are your pet peeves regarding pitches? Following up over and over and over again if I don’t respond to a pitch. If I don’t respond, it’s because the pitch wasn’t a fit. Agreeing to an interview and then becoming a no-show. What are the three most important trends related to PR? AI – I’ve read, and written about, AI and its potential for impact on the writing industry/content marketing – I think there is also potential for an impact on PR activities on both sides – e.g. the use of chatbots to engage reporters/editors, using predictive analytics to spot trends, or impending crises, etc. How are the skills and requirements for the fields changing? The bottom line, though, I think (but of course I’m biased) is that strong writing will continue to be the most important skill for both journalists and PR professionals. And, in fact, I think the bar is being raised here. As more and more content is being created, and even though Google has clamped down on a lot of the “junk content” out there, content consumers will become increasingly discriminating. Media outlets competing for eyeballs will need to meet that demand for higher levels of quality. I think that as AI allows some of the administrative, rote types of activities to be automated, outlets will be able to focus on being more strategic, more discerning and more discriminating in terms of the content they produce–and its validity, accuracy and quality.